The C-Pen Exam Reader pen scanner is a major technological breakthrough for anyone wanting to read English, Spanish, French, Italian and German exam questions. 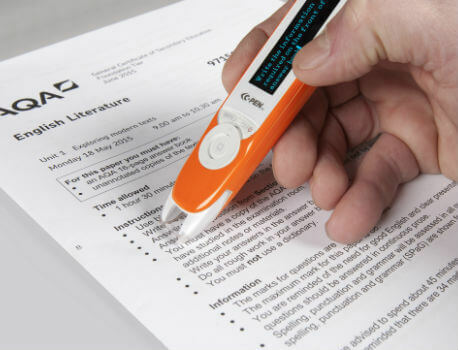 The C-Pen Exam Reader is a totally portable, pocket-sized device that reads text aloud with an English, Spanish, French, Italian and German human-like digital voice. This means students who have reading difficulties such as dyslexia can independently take exams knowing that they can read and understand the questions. No special access arrangements required. Use C-Pen Exam Reader to read printed text for you! C-Pen Exam Reader features a high quality naturally speaking British English, American English, Spanish, French, Italian and German voice. The C-Pen Exam Reader is small, portable, and lightweight making it easy to carry with you anywhere you like to read. We offer schools a free 30 day trial, please complete this form.